We’re excited to launch a new year of wound care topics. But first, we’re looking back at the WCEI blogs you liked best in 2017. Here are the year’s most read (and often most shared and discussed) posts. 1. Wet-to-Dry Dressings: Why Not? 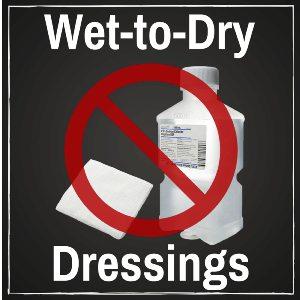 What should wound care professionals do when a physician orders wet-to-dry dressings? Be prepared and know the facts. Pictured: Trauma caused by wet-to-dry dressing. Those of us in wound care know that wet-to-dry dressings are considered substandard care. Some physicians, however, commonly order wet-to-dry dressings for patients, often leaving clinicians in a tricky situation. Do you feel conflicted as to how you should respond? It can be intimidating, but with a little preparation, it doesn’t have to be. By knowing the facts about wet-to-dry dressings, as well as effective and cost-efficient alternatives, you can handle such situations with confidence. Not sure where to start? We’re here to help. Posted in Debridement, Wound Care | Comments Off on Wet-to-Dry Dressings: Why Not? The field of wound care has come a long way. And with over 25,000 WCEI alumni across the country sharing their skills and knowledge, we’re thrilled to see many outdated notions and practices go by the wayside. Unfortunately, there are still some wound care myths out there that just refuse to die. Here are five of the most frequent incorrect statements we still hear about out in the field. Myth #1: Wet-to-dry dressings are cheaper to use. Not only is wet-to-dry substandard care (as we discuss in Wet-to-Dry Dressings: Why Not? ), it’s not even cost-effective. Out of all the different dressings out there, foam keeps the wound bed the warmest. And foam dressings can remain in place from 3 to 7 days, decreasing costs, labor and drops in temperature. As always, with any dressing application, follow the manufacturer’s instructions on proper usage. Myth #2: Bleeding in a chronic wound is a sign of healing. By putting on our detective hats and looking at the clues the wound is giving us, we can identify issues sooner rather than later. Myth #3: Erythema is a sure sign of wound infection. If you see at least three of these signs, it means you have local infection and need to immediately treat the wound topically, before it moves into a systemic infection. Myth #4: Oral or IV antibiotics are indicated for all infected wounds. Administer oral or IV antibiotics only if infection extends beyond the wound margin, indicating a systemic infection. In other words, you need to see signs and symptoms such as fever, an elevated white blood cell count, or red streaks emanating from the wound. Oral antibiotics are simply not the most effective treatment for local infections. Many chronic wounds have impaired blood flow, which can compromise the delivery of oral antibiotics to that wound. Meanwhile, the unnecessary use of antibiotics leads to the development of antibiotic-resistant strains of bacteria. So make sure you have first identified if this is a local or systematic infection. If systematic, then you should treat with oral/IV antibiotics. Myth #5: Clinicians are not responsible if a physician orders inappropriate treatment. We hear this excuse all the time! Would you administer improper heart medication to a patient if you knew it was wrong? You have to think of wound care the same way. It’s our responsibility to uphold the standards of care. If physicians are unaware of the guidelines and policies, we need to educate them. Saying that the doctor wrote it and you merely followed orders is not going to protect you legally, and it’s certainly not in the best interest of your patient. Always practice the current standard of care – no excuses! What myths do you battle? While these are some of the most common myths in wound care, we know there are more. What are some of the common misconceptions within your practice, and how to you deal with them? Have you been in a situation where you had to help educate physicians or colleagues? Please tell us about your stories below. In the modern world of wound care, we’ve seen drastic improvements in treatment options over the years. So it’s always a surprise when we hear that there are still orders being submitted these days for outdated practices. In this case, we’re talking about those dreaded wet-to-dry dressings. Why is this still happening – even though the disadvantages to this approach are well-documented? Could it simply be due to a lack of education? Or maybe it’s due to the unavailability of other wound care products that have been shown to yield much better (and safer) outcomes. Whatever the reason, we’re here to double-down on this: no more wet-to-dry dressings. A moist saline gauze is placed onto the wound bed. The dressing is allowed to dry and adhere to the tissue in the wound bed. Once the gauze is dry, the clinician forcefully removes the gauze. Any dead tissue that has adhered to the dry gauze will then be removed from wound bed. These steps are to be repeated every 4 to 6 hours. Although this is technically the way wet-to-dry dressings are applied, most often clinicians will modify it by moistening the gauze prior to removal. This is so that it won’t stick to the wound bed and cause bleeding and trauma, or remove healthy tissue along with it. The problem is that, while well-intentioned, the moistening of the gauze before removal, which spares the patient pain, defeats the original purpose (mechanical debridement). In addition, the prescribing clinician’s orders are not being followed. To further complicate matters, some professionals with prescriptive authority write for this dressing but do not understand it is for debridement. For example, a Physician’s Assistant once explained that he thought this type of dressing meant that the wound bed would be kept moist and covered with a dry secondary dressing. So in many cases, we have wet-to-dry orders being written by someone who doesn’t understand what they’re ordering, and we have clinicians implementing these orders incorrectly. The 2014 International Pressure Ulcer Guidelines clearly state that wet-to-dry dressings can be painful and may remove healthy tissue. It also states that they are being used less frequently. In fact, research shows that this procedure is associated with slower healing rates and are costly in professional time due to the need for frequent wound dressing changes. Sharing information. Proper educational resources and information regarding this issue need to be shared with not only nursing staff, but also with those who write the orders. Making a plan. Talk to your medical director and plan a short educational program to present alternatives for those with prescriptive authority. Asking for change. Ask for a facility policy change from your medical director that states wet-to-dry dressing orders are no longer acceptable. Talking about it. Keep the discussion going and enlist help from all levels of the organization. Learning from others. There are plenty of success stories out there from facilities that have planned for and implemented change involving key stake holders. Know that changes can be made, and don’t get discouraged if it doesn’t happen quickly. Remember, your patients are counting on you. Do you work in a facility that has eliminated wet-to-dry dressings? How did this change in policy take place, and do you have tips for others who are dealing with this problem? We would love to hear about your experiences having to do with this topic. Please leave your comments below.